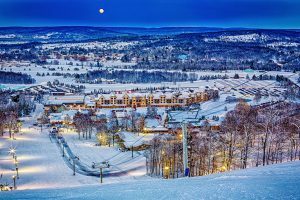 Boyne Falls, MI – Skiers and riders visiting Boyne’s two Michigan resorts will find new night skiing, expanded glades, new ways to unwind, and more this winter season. 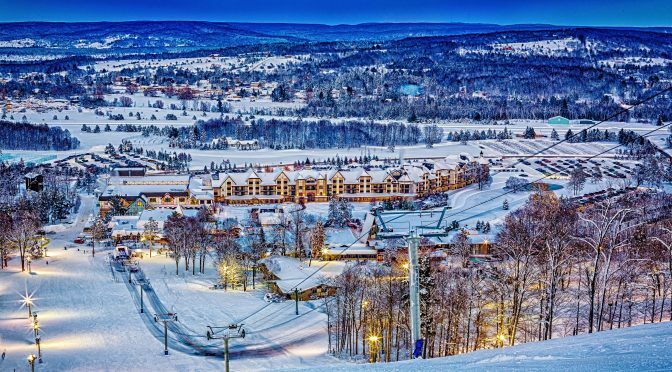 Nighttime skiers and riders can enjoy an additional 30 acres of terrain this winter with the addition of lights in the popular Meadows area at Boyne Mountain. The new lights will illuminate The Meadows, Idiots Delight, Thunder and Stein’s Mambo with lift access via the Meadows chairlift, a Doppelmayr conveyor-loaded quad that offers the second fastest ride up the mountain. Night session lift tickets are available Wednesday-Saturday, 5-9 p.m., and daily during holidays. Those looking for a more serene experience by the glow of oil lanterns and moonlight along a mile-long cross country ski trail lit each Friday and Saturday evening at Boyne Highlands. Trail passes are $10 after 4 p.m., and free for ages eight and under. The Tyler’s Tango glade at Boyne Highlands, which has been expanded to triple its original size, has also added an additional access point located skiers right of Amy’s chairlift. Ten Boyne Low-E fan guns are being relocated to key tower positions around Boyne Highlands, maximizing snowmaking efficiencies. Boyne Highlands’ Tubing Park is also being expanding with additional lanes this winter closer to the Camelot lift. Reconfiguring the park will allow this popular attraction to open earlier in the season. The Tubing Park is open to adults and children ages five and above, with one-hour, two-hour and all day tickets available. Young splashers have a new space to enjoy at Avalanche Bay at Boyne Mountain, Michigan’s largest indoor waterpark. Fritz’s Snow Fort offers kids up to age 12 a play structure loft and place to create fun crafts and art projects with new offerings scheduled daily on weekends and also open for expanded hours during holiday periods. Access to the Fort is complimentary for resort lodging guests, and is also included with admission to Avalanche Bay Indoor Waterpark. Newly refreshed, The Spa at Boyne Mountain, formerly Solace Spa, has received a significant makeover with a transformation to its salon, entrance, retail area and fitness facilities. Inspired by the area’s natural beauty, warm earth tones complement a cool new modern setting. An open flow salon concept was designed to encourage socializing with cozy relaxation areas, four pedicure chairs, two manicure stations, makeup services, cut, coloring and styling – all with picturesque mountain views. With specialists in the science and art of reflexology, relaxation, massage, and wellness, The Spa offers an array of services within its 18 treatment rooms. As the largest spa facility in Michigan (19,500 square feet), The Spa rejuvenates and recharges active adventurers with full-service amenities, including cedar saunas, steam rooms, whirlpools, state-of-the-art fitness equipment, fitness classes, indoor/outdoor swimming pool, hot tubs, and more. Last winter saw the launch of Summit-to-Stein’s Snowshoe Suppers, an evening that combines a snowshoe hike, hot toddies, bonfire, and three-course dinner. The evenings were so popular that Boyne Mountain is expanding the offering to Friday nights in addition to Saturday evenings. The Friday Summit-to-Stein’s Snowshoe Suppers begin at 6:30 p.m. with a ride up Boyne Mountain’s Hemlock summit double chairlift, with spiced wine and hot chocolate waiting at the Eagle’s Nest. There, snowshoes are provided and guests can stomp their way along snow-covered trees and trails stopping at a bonfire to restock on beverages and enjoy the ambiance of a refreshing winter evening before arriving at the final destination, Stein Eriksen’s restaurant. Guests are greeted with live entertainment and a three-course dinner of cheese fondue, choice of beef or fish entrée, and a chocolate fondue with fruits and cookies. The Saturday supper features a prime rib and shrimp buffet. 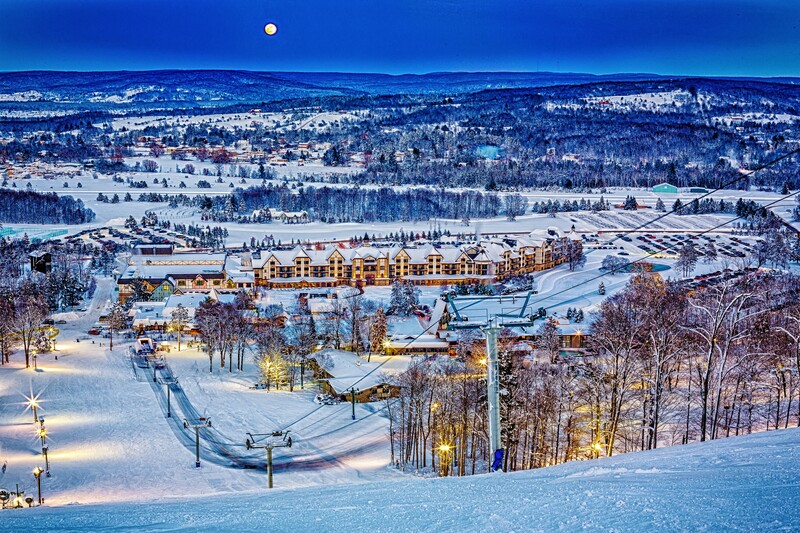 Snowshoe Dinners are coming this winter to Boyne Highlands as well, on a more limited basis. Guests can delight in three new enchanted snowshoe expeditions this winter, each culminating with a gourmet three-course dinner. The events are scheduled for Jan. 6, 2017; Feb. 3, 2017; and March 3, 2017. The snowshoe hikes depart at 5:30 p.m.with each event offering a unique snowshoe route, and dining location including North Peak at the top of the slopes, Olympic Room with a bird’s eye view of the slopes, and the Country Club of Boyne in the heart of the resort’s best trails. A family style dinner is served following snowshoeing at 7 p.m. Guests at Boyne Mountain can browse gear in two new shops now open in the resort’s Village. The newest addition is the Under Armour Store offering a wide assortment of the latest apparel, footwear, accessories and logo wear for every member of the family. Located underneath the Under Armour Store is the The North Face Store, a one-stop shop carrying a selection of men’s, women’s and juniors clothing and outerwear, as well as footwear and backpacks. Under Armour and The North Face stores join six other businesses operating in the Village, including Boyne Country Sports, Boyne Outfitters, Forty Acres Tavern, Kilwins, Mountain Express Deli & Provisions, and Spielladen Toy & Candy.